Check out Metroid Prime: Federation Force's final boss battle and ending! What do the Space Pirates have in store for the Federation? And does Samus make an appearance? It has to b..
We take on Mission 12 of Metroid Prime: Federation Force where we must stop a rampaging monster from destroying a probe! See how it plays and check out the cameo of a certain bount.. Check out the opening cutscene for Metroid Prime: Federation Force that explains the game's story, including the Galactic Federation and Space Pirates! 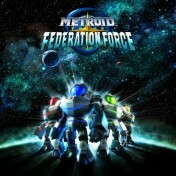 Buy Metroid Prime: FF @ AMAZ..
http://www.ninwr.com Sean Miller YouTube Page - https://www.youtube.com/watch?v=HuYabYSqtLA WatchmeplayNintendo YouTube Page - https://www.youtube.com..